Playa Destiladeras. Photo taken from Rancho Banderas Resort. Traveling the highway heading north from Nuevo Vallarta toward Punta de Mita, Playa Destiladeras is easy to spot as it is by far one of the loveliest stretches of white-sand beach along the north shore of Banderas Bay. Taking a bus from Bucerias the cost is 60 pesos (2014). Near the prestigious master-planned development of Nahui, which is still undergoing construction, you will find easy public access to Playa Destiladeras. Just look for the sign that says “Nahui” as there are no clear signs indicating “Playa Destiladeras.” At this access point there is ample visitor parking on a large unpaid surface with steps leading down to the beach. During the week parking is usually free, but during the weekends we have been charged 50 pesos to park. One thing to watch out for when entering the parking area is the large tope (speed bump) that can really scrape up the under carriage of your car. With a very gradual deepening of the water extending outward from the beach, Playa Destiladeras is a safe place to have fun playing in the rolling surf or to go swimming in the ocean as there is no undertow. There are vendors along the beach who rent out umbrellas, but be sure to bring your own towel. The beach is several miles long with soft powdery sand, and is nice, wide, flat and great for walking. Our family’s favorite place to enjoy Destiladeras Beach is beneath Pepper’s Restaurant at the Rancho Banderas Resort complex. Restaurant reservations are needed at Peppers in order to gain entry off the highway to this lovely complex, or you can get to Peppers by walking down the beach and asking the resort’s security staff for permission to come up and enjoy a meal. The resort staff is very friendly. After a delicious breakfast, lunch or dinner at Peppers, it’s nice to walk the nearby section of Destiladeras Beach, or just sit quietly on the sand and take in the area’s natural beauty. 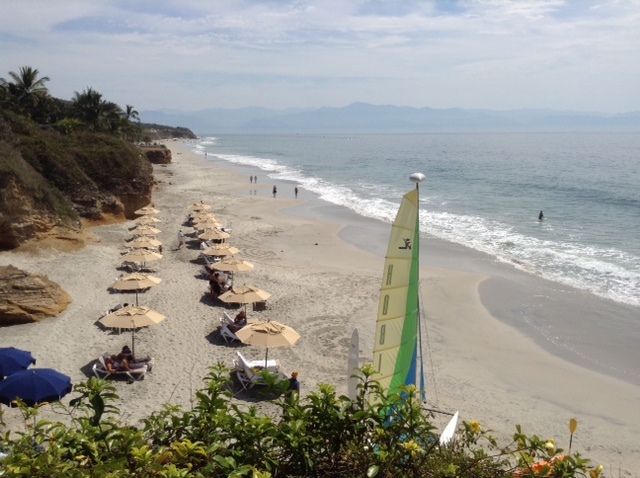 From Destiladeras Beach visitors are afforded gorgeous panoramic views of the sparkling Pacific Ocean as well as wonderful views of the city of Puerto Vallarta on the opposite side of the bay.